Some 1,600 Navy personnel and 1,000 soldiers are to be laid off in the first tranche of redundancies from the Armed Forces, the government says. Personnel, including 150 Gurkhas, will be told in September, but no-one on operations or pre or post-operations will face compulsory redundancy. 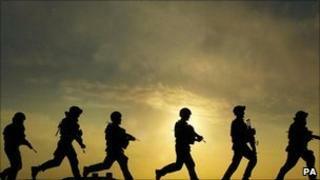 Defence Minister Andrew Robathan said the move - part of £5bn defence review cuts - would help reduce the deficit. The RAF earlier announced plans to lay off an initial 1,000 staff. In total, 11,000 serving personnel will lose their jobs over four years. Under the Strategic Defence and Security Review announced in October, the Ministry of Defence is to cut 17,000 jobs across all three Services - 7,000 in the Army, 5,000 in the Navy and 5,000 from the RAF. But it is expected 6,000 of these will be achieved through a decrease in recruitment and by not replacing those who leave. Mr Robathan said UK military operations in Libya and Afghanistan will not be impacted "adversely" by the redundancies from the armed forces. He told the Commons that voluntary redundancies were being sought, which could include personnel currently on operations. The initial Navy redundancies will include 121 officers up to the rank of captain from the warfare, engineering, medical and logistics branches while about 25% of the first Army job losses will come from officers up to the rank of brigadier. The 3,500-strong Brigade of Gurkhas - championed by the actress Joanna Lumley in a battle over their rights to settle in the UK - would lose soldiers including infantry, engineers, signallers, and logisticians. Royal Marines, Special Forces, Army bomb disposal experts, the Intelligence Corps and the Royal Army Medical Corps are all exempt from the current round of redundancies. Under the RAF plans, the first tranche of 1,020 jobs includes up to 170 trainee pilots. The announcement comes on the day the RAF's chief said the service would need "genuine increases" in its budget to run the range of operations which ministers demand. In the Commons, shadow defence minister Jim Murphy said details of the latest redundancies were leaked to the media over the weekend and this showed the military had been subject to more "shabby" treatment. Media captionFormer First Sea Lord Jonathon Band: "It's a period of huge uncertainty"
In February, the Army apologised to 38 soldiers who learned by e-mail that they were losing their jobs. The men - all long-serving warrant officers and including one working in Afghanistan - were told they were victims of the defence cuts. Mr Murphy said: "We all know no-one can stop all redundancies within the Ministry of Defence but the first time this was mishandled, ministers said it was an accident. "The second time they said it was a mistake. Well on behalf of these benches, the third time is simply inexcusable." In a Guardian interview, Air Chief Marshal Sir Stephen Dalton has warned that without more investment, the RAF would struggle to maintain current levels of capabilities. ACM Dalton said his assumption was that the RAF's warplanes and surveillance aircraft would be needed over Libya for a number of months, rather than weeks. "In general terms [we] are now planning on the basis of at least six months, and we'll see where we go from there," he said. A poll for BBC News on Sunday suggested that two-thirds of people believed Britain's military involvement in Libya would go on for some time. ACM Dalton issued a warning that the RAF would need an increase in spending from the next Comprehensive Spending Review in 2014. Without "genuine increases", he said the RAF would find it "very difficult" to maintain its current levels of capability - with operations in Afghanistan, the Falklands and Libya. "The key factor is that if we are to meet the requirements laid upon us, there is no question that more investment will be needed to achieve that," he said. "What I am seeking to do is maintain core competencies and bricks on which we can then build the future." The MoD will also lose 25,000 civilian staff under the defence review, which will see spending fall by 8% over four years. But the government says the UK would still meet Nato's target of spending 2% of GDP on defence and would continue to have the world's fourth largest military and "punch above its weight".